One of the most overwhelming parts of reading running blogs is the exposure to the endless race possibilities. A year and a half ago, I had no clue that more than 5-10 marathons even existed let alone what they were called. I didn’t know that there was a Chicago Marathon, and while I think I knew that there was a Boston Marathon, I didn’t know that it was any sort of a big deal (now we’re all on a first name basis). But with all this exposure comes tremendous race envy. *Almost* every recap I read drives me to look at my bank account to analyze if next year’s race fits into our budget. I mean, all of the sudden I want to go to places like Duluth and Cincinnati for fun? What is going on here? (keep in mind that I say this out of love if you live in those places. Albuquerque isn’t a dream boat city either). But we can’t leave town every weekend to run races, so choices must be made. This will be the 2nd time that I attempt to map out our race schedule for the entire year. Realistically, we can afford one, maybe two, major “destination” race per year (last year it was Chicago, this year it is Boston), so everything else has to be regional (Arizona, Las Vegas, Colorado, or West Texas). And timing plays a big part. We need to have plenty of rest in between races to recover physically and financially. And as a glass half full type person, I’m always under the impression that at any given time I will injure myself and never be able to run again, so I want to run the “must-do’s” first whenever possible. Running Chicago as my first marathon was no accident. I wanted my first time to be with a marathon that I really loved. 1) Boston. Everything else this spring has to revolve around it include filing taxes. 2) Aaron has expressed that he’s getting burned out with our constant road racing, so I want to incorporate more “non-traditional” races in the mix. 3) Training for a triathlon. I’m going to need a few months off of running just to focus on swimming and bike riding because this IS happening in 2013. JANUARY: Rock n Roll Arizona Half. MARCH: Bataan Memorial Death March 14.2 miler (Las Cruces, NM about 3 hours south of Albuquerque): This race has a full marathon and a “half” option that is actually misleading since it is more than half a marathon. This is New Mexico’s “big deal” marathon and it is really geared toward veterans and active duty service members. Many members of the military will run it in full uniform with a loaded backpack. Lots of uphill, REALLY warm temperatures, lots of loose sand, and likely some rattlesnakes nearby. This is actually considered one of the hardest courses in the country. My dad is planning on running the full marathon (WHAT????) and even my little sister is planning on running the half. I don’t even know my family anymore. APRIL: Boston Marathon. Considered the most prestigious road race in the world. Still somewhat in denial that I’ll be running it. MAY: Run for the Zoo Half (Albuquerque): This falls just a few weeks after Boston, so this is a BIG maybe even though it has become a yearly tradition for me. It took me a month after the Chicago Marathon to be able to run again. I’m hoping for a faster recovery time this go around, but I probably won’t register for this until the week of. JUNE: Garden of the Gods 10 Mile Run (Colorado Springs). This race is full of rolling hills, but at least each uphill is matched with a downhill. The views are gorgeous apparently. SEPTEMBER: Imogene Pass Run 17 miler (Ouray-Telluride, CO): Aaron has run this race before. It sounds miserable yet amazing. The website says the following: “The reality is that despite whatever emotions we may have for the mountains and their environment, they are in fact unfeeling objects and they follow the natural rules of physics which are not always benevolent toward living creatures, great or small.” I guess they all can’t be easy. Check out that elevation climb! Please note the trail. And the lack of trees. OCTOBER/NOVEMBER: We’re going to put in for the Nike Women’s and ING New York City lotteries (if New York opens it up). Statistically we’re not likely to get into either one. But a girl can dream. Duke City Half (Albuquerque, October): This was my first half marathon. Not the most amazing course, but it will be good to do if (when) I don’t selected for NWM or NYC. Plus, you can’t beat a local race where you can go home and nap in your own bed right after. Tucson Marathon (December): A downhill marathon! I don’t really want to get into the marathon habit, but if I decide after Boston that I MUST RUN MORE MARATHONS, I think a downhill one will be a nice option. Rock n Roll Denver Half (September): This is a back up if Imogene fills up before we register (last year it only took a few hours). I plan on spending the summer in the pool or on a bike, so I don’t want any big races during those months. Otherwise, everything is pretty open and subject to change. Anyone else doing any of these races? Any other good recommendations in the Colorado, Arizona, or west Texas areas? I didn’t know you were doing the R’n’R this weekend…shoot…how do I miss these things. If I would’ve signed up I could have met you two and a couple other bloggers, oh well, next year! Your race schedule looks…umm…INTENSE…the Imogene trail race looks like absolute death, I hiked last year at 10,000 feet and felt terribly out of breath, I can’t imagine running at 13k…uphill! You two are nuts but at least you are nuts together. AND, the fact that your dad is running the full Bataan is NUTS, so awesome to see your family is living a healthy lifestyle…I recently became psyched because my dad has committed to walking 3 miles a day! Arizona is actually next weekend. I kinda thought I talked about it a lot? But then I also try and be a little bit ambiguous about when I’m not going to be home so people have to do their research before robbing me. You still have time to sign up! We know of a great brewery near the start line! And Albuquerque is pretty high in elevation, so I’m acclimated to it, but I’m a bit worried about running at 13,000 feet. Aaron said he felt drugged near the top. And I’m super excited for my dad! He’s a retired Colonel, so he’s actually done the Bataan half in full uniform (which makes it more of a hike), but I *think* he’s going to try and run it this time! I thought it was this weekend…I would have pondered the drive but next weekend I have an Indian wedding to attend…it takes two days…anyway, next time! Intense, I would imagine the feeling to be drugged, dream-like, dizzy and all around not very fun when oxygen isnt getting to the brain. Your dad sounds like a machine, I thought he just started running recently, I am obviously way off base. See what I did there?! We’re post twins today 🙂 These races look awesome. I seriously need to branch out from road racing. You and Aaron so much more rugged than I am! Haha! Never in the history of the world has anyone ever called me rugged! But Aaron definitely is, and I think I’ve kind of cramped his outdoor lifestyle over the last few years, so I figure it’s time to start doing more “Aaron” type races! Looks like a fun race schedule! Holla when you’re in CO!! I need to figure out my 2013 race schedule, too… you found so many fun races! The CO ten miler looks amazing. I need to get past this marathon before I can really concentrate on what is next! Maybe after yesterday, you’ll want to include more marathons in that schedule! I’ve already done the Bataan March. This time I think I know what I’m doing. It is grueling. But you only did the half, right? It certainly doesn’t look like a happy walk through the park! As a potential alternative to Imogene (since you probably won’t want to run both races in back-to-back months), how about Pikes Peak in August? Either the Ascent (half marathon) which climbs 7,815ft to the summit, or the Marathon which climbs to the summit then descends again. I “raced” the Ascent three years ago and had a great time, though coming from sea level I never dreamed miles 11-13 of a race could take so long to complete. Plus you’ll then be able to say you’ve run a 14er. Sounds like a strong year is on the horizon no matter what you decide… good luck with it! Thanks for the suggestion! Definitely a race (fast hike?) to look into. Even though I live at elevation, I think those last miles would prove quite challenging! Regardless, I think we’re choosing Pike’s Peak as our 14er to climb. I want to do RnR Vegas soo bad! I totally agree that I am always reading race posts and would love to do more races. BTW, in my experience tri training is fantastic cross training for marathons, so I think everything should fit together well! I’m always amazed at how many races there are. I want to do them all! And I’m hoping that tri training will really compliment running. At the very least, I’m hoping for my body not to get injured from overuse of the same muscle groups! I’ve done RnR Vegas, it’s a fun race. I might do it again some time. I started keeping a Word doc of races I read about and want to do because I have got to get myself under control and stop signing up for every race I hear about! But I worry I’m going to forget about races I think sound cool. Speaking of, the Garden of the Gods sounds fun – must go add that to my list now! Come do Garden of the Gods with us! I should start a document too. Right now I just “like” the facebook pages of races I really want to do so I get reminders about registration and such, but it isn’t the most organized approach! I totally would if this new job wasn’t so limiting on my vacation time. Whatever half marathons I do this fall, I’ll have to do them local since I’m tapped out of vacation time. Boo!!! My vacation schedule isn’t great either. That’s definitely another reason why all of our races have to be “weekend” getaways. I feel your pain. I’m probably gonna be stuck running 2 half marathons this year that aren’t on my “bucket” list but they’ll meet my goal to run 4 half marathons in 2013. Some of those races sound brutal, but really fun too. I wish your racing calendar would bring you out to Northern California! Maybe in 2014? Tell Aaron that we’ve got lots of great trail running here!! Well, if I get into Nike Women’s I’ll be there! We usually get to San Francisco every couple of years anyway just because it is my favorite place in the world. But between your and Mike’s race recaps, I’ve added a bunch of new races I’d never heard of to the list! I wish I had been into racing when I actually lived there! Oh, I forgot about NWM. I guess there’s now a NWM in DC too, so wasn’t sure which one you were referring to. Anyway, it’d be so fun if you, Mike, and I could do a Brazen race together! Very envious that you’re doing both the Bataan Memorial Death March (especially because there are fewer and fewer survivors left) and the Garden of the Gods run. I’d love to do both of those. Very neat! I know! I think they are down to the very last few survivors. That’s another reason why I’m wanting to do it now. Great list! I have always wanted to do the Imogene run. Every time we are in Telluride I run/hike to Tomboy. I love that climb and the amazing views! I was supposed to run the Phoenix Rock n Roll next weekend but the friend I was going with got a stress fracture, so I decided not to go. I ran the full last year and kinda wish I was going now. Have a great race. I was wondering if I’d see you there! I hope your friend is ok. Stress fractures are terrible. At this point, I’m most looking forward to warmer weather. And I’ve never been to Telluride, so I’m excited to see the whole area. I’ve heard it is absolutely beautiful! I too need to stretch my limits outside of road racing-especially because I live in the mountains and love trail running. Everything is on hold for a few months until we find out where we are moving to. Bummer, because it makes planning tough. I’m actually amazed at how many trail races there are! It seems to be a growing trend. And I hardly ever sign up for races until right before (unless, like Imogene, they fill up right away) because you never know what crazy things could happen! I ran Tucson two years ago and had a great time (mostly because I PR’d the hell out of it thanks to the downhill). T-Rex ran the Bataan race, so I’m sure you can learn a lot about it through her blog (if you haven’t already) and I’ve heard that the Imogene race attracts a strange lot, including one guy who safety-pinned his bib through his skin. Yeah. Loosen the hinges. Regardless, those all sound like excellent options. 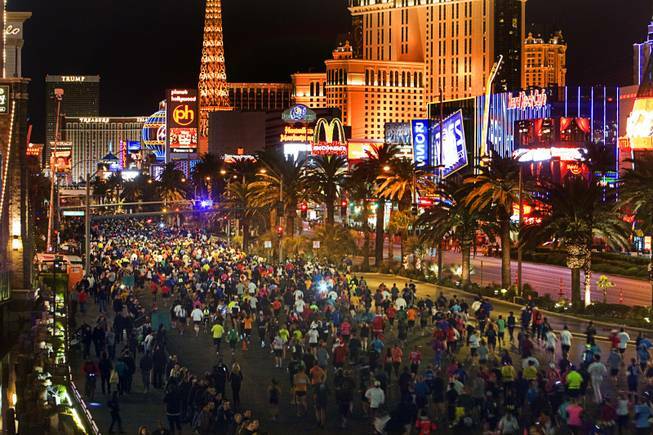 If you want another non-traditional race, try the Hoover Dam Marathon & Half Marathon: http://dans-marathon.com/2012/12/17/state-29-nevada-2012-hoover-dam-marathon — it’s just two weeks after RNR and it’s close enough to Vegas that you can still get the experience. Not on your anniversary though, so that’s a minus. Alas! I did read T-Rex’s Bataan Recap, and it made me very happy that I’m not going with the full version of this race! And I have yet to find anyone who ran Tuscon and didn’t absolutely love it (and their chip time!). I’ll look into The Hoover Dam race. Now that I consider myself a more “seasoned”/educated racer, I am at least looking into RnR alternatives, especially in cases where a perfectly fine race was taken over….BUT I still really want to run the strip at night dressed as a runner bride…so, sometimes you gotta do what you gotta do. I dig the new header. I’ve got to get on planning my running season. I’m kind of bummed out here on our island because my options are limited, but would love to run some of the ones you’re doing in CO…and since I have family there, who knows?! I guess living in the middle of the ocean would really limit race options! Talk about having to plan ahead of time!